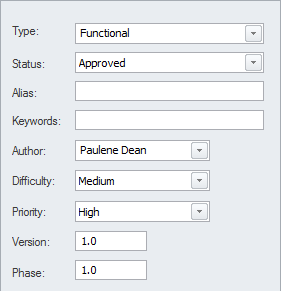 Requirement Properties are used to define metadata about the requirement that is useful for the management of requirements for the purpose of prioritization and defining work packages for the implementation teams. All Enterprise Architect elements have standard properties such as Status, Author and Phase but the Requirement element has additional properties such as Difficulty and Priority. User defined properties can also be defined using Tagged Values. To define the important meta information about a requirement for the purposes of providing data to manage the requirements for prioritization, understanding which are the difficult requirements, and managing the lifecycle by using Status to determine requirements for implementation Packages. Enterprise Architect has a wide range of built in properties for all elements but it has a number of additional properties for requirements. If there are other properties that are needed by a modeler or team such as the volatility (stability) of a requirement these can be added using the general purpose UML extension mechanism of Tagged Values.